While working on InDee Toons, I have discovered a way to create dynamic lighting information for 2D images. After some pretty promising tests with Image Magick, the first prototype of Sprite DLight was born. What initially started as a research on how to provide normal maps for my game characters, turned into an independent project that seems to be of interest to a lot of people. 2D games and pixel art combined with dynamic lighting appears to be an explosive mixture, because you can achieve wonderful atmospheric effects while maintaining the individual 2D art style. I am developing the tool for Windows and Linux platforms and hope to show it on kickstarter soon. The core feature of Sprite DLight is the generation of a normal map from one single sprite file as the input image. 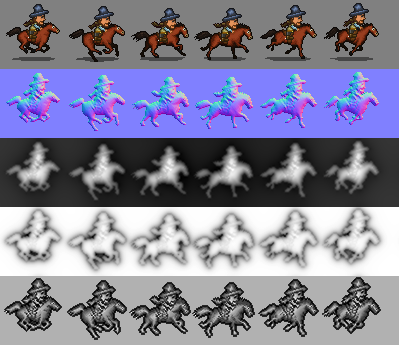 While existing normal map generation tools need at least two additionally drawn lightmaps to produce a normal map (which can be painful when you want to use it with animated characters), Sprite DLight can be fed with already existing sprites and sprite sheets, reducing the effort needed to create the 3D information, to a few clicks. Annotation: "Boot Hill Heroes" does not feature dynamic lighting (this should not prevent you from checking it out), but the artist kindly allowed me to use the sprites. I am now looking for more nice art of different styles, depicting game characters, objects, trees and more, to demonstrate the effect of dynamic lighting and the quality of the automatically generated maps. If you are interested in making a 2D game featuring normal mapped sprites, or if you would like to see your art with dynamic lighting - probably featured in my kickstarter video/page (of course with a reference to you and your copyright), please leave me a comment, use the contact form or email me. Also be sure not to miss the updates here, on Facebook and on Twitter. People often have trouble understanding the word "tradeoff", sure enough it's easy enough to understand as exchange but in today's corporate parlance it is meant as exchange of one commodity as a cost for another. I was playing Final Fantasy's Dissidia on the good old PSP yesterday when I marveled at the video games replay value, yes I have spent over 50 hours on it already, which is what this entire topic is all about. Normally if you look at the oldest games like Mario and Dave, they had one thing unanimously common, addiction to it.